Rwwwarrrarrrragghh! Backstory time! You know what we're talking about. 8 features films and counting just ain't quite enough when it comes to Star Wars. So, how 'bout a new flick? And, come to think of it, we're always in the mood for more prequels. Especially ones that feature our favorite of all time, Chewie! Solo: A Star Wars Story takes on all that and more and while Han's story is the focus, there's still plenty of Chewie in the movie for us to love. Not to get spoilery here, but when Chewie and Han first meet? Too cool! So. Of course, you're all about it, so you're ready to meet Han and go on your first mission together. And all you gotta do is suit up in this Chewbacca costume, and you'll be ready to roll! 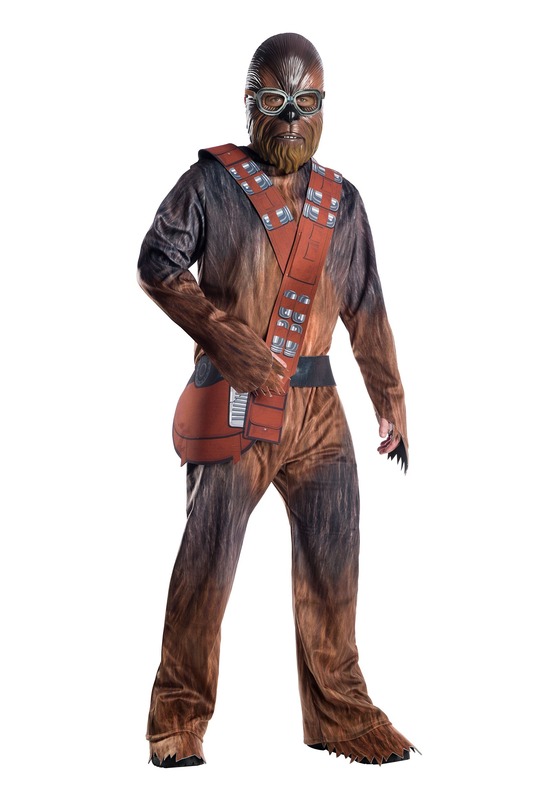 Star Wars officially licensed, this costume comes styled as a fully printed jumpsuit. That's right, no messy faux fur to slow you down or overheat! But, the sublimated print does indeed look like Chewbacca's fur, and you'll look even more like the real deal when you slip on the fabric bandolier and sidebag. And the plastic mask will complete the effect, complete with goggles depicted to recreate that intense Solo: A Star Wars Movie action! Fact is, we've got the Star Wars universe covered from front to back, with all your favorite characters from the epic movies. Assemble your own band of Rebels or even a group of dark side devotees from our wide selection of Star Wars costumes. One thing's for sure, when you get your gang together in these costumes, you're gonna have the most epic Halloween, ever!